Haq's Musings: US DoD 1999 Forecast: "Pakistan Disappears By 2015"
This is hilarious. Why would any forecaster ever make a "point forecast." Forecasting is very difficult,especially about the future: that is quote from the physicist Neil Bohr. At the minimum, one has to do scenarios. 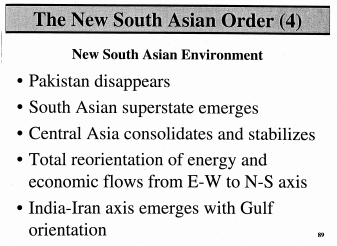 Recall I laid out five or six scenarios of Pakistan's future in my talk to the US Army War college in July 2001. Professor Ahsan Ahrari was the moderator. There were several speakers. I published the scenarios in the Karachi-based publication, Defence Journal. Ahmad: " This is hilarious. Why would any forecaster ever make a "point forecast." Forecasting is very difficult,especially about the future: that is quote from the physicist Neil Bohr." Thanks to Almighty Allah and thanks to Pak Army and Intelligence agencies..
Great article, and a joy to read. I take the same pleasure you do in reading the wealth of substandard literature out there penned by hindustanis with adorably overactive imaginations. Another who comes to mind is Sumit Ganguly, who has dedicated an entire life to poring over Pakistan with the traditional obsession of a jilted partner. In Newsweek back in 2008 he wrote an article excitedly predicting the collapse of Pakistan; unsurprisingly, the editorial team have not responded to any of my regular queries since then, about how that prediction is working out! The real comedy comes from the attempts that these sheltered pseudo-intellectuals make to couch their fantastical hatred in vaguely strategic vocabulary: "Total reorientation of energy and economic flows from E-W to N-S axis"?! It reminds me of the excitement I would feel when playing online strategy games as a young teenager, babbling on with similar verbiage without having any real idea what I was talking about. In short, if these are the master strategists and policy makers in hindustan's corridors of power, us Pakistanis don't have anything to fear. Keep up the good work, I love your blog. I know Ashley Tellis. He is a Steve Cohen protege. One of the others that some of you is Sumit Ganguly. Full of venom. I have had a heated debate with him when he was visiting Stanford. Ahmad: "One of the others that some of you is Sumit Ganguly. Full of venom. I have had a heated debate with him when he was visiting Stanford"
You probably conceded too much to Sumit Ganguly but that wasn't good enough for him. He and others like him demand total and complete agreement with their venomous views on Pakistan. I do think, however, that most Americans who work with them are not naive. They see these specimen serving a purpose. There's a guy by the name of Raghubir Goyal who covers the White House for some dubious Indian publication. He's rarely called upon to ask a question during press briefings but everyone knows what he's going to ask: What is the US going to do about all of the latest terrible things Pakistan is supposedly guilty of? But the successive White House press secretaries have used him when they're in a jam on some issue and they're trying to distract. Reporters in Washington have given it the moniker "Goyal Foil". Dear Riaz Bhai. Pakistan disappeared in 1971. Bangladesh was the REAL Pakistan. What is left overs are now calling themselves Pakistan. 19640909rk "Pakistan disappeared in 1971. Bangladesh was the REAL Pakistan. What is left overs are now calling themselves Pakistan." 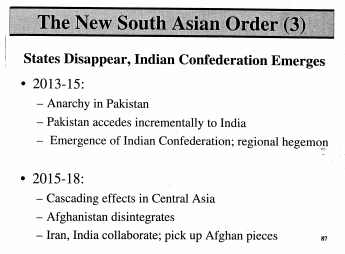 The DoD's "Pakistan disappears by 2015" was made in 1999. Why didn't they know "Pakistan disappeared in 1971"? I guess you know a lot more about Pakistan than your fellow Indian "intellectuals" Ashley Tellis and Rajan Menon.